The monument commemorates the fifteen members of the Special Air Service Regiment and the three members of the Army Aviation Corps who were killed in a helicopter disaster on training exercises at night in Queensland in 1996. On the 12th June 1996, soldiers from the Special Air Service Regiment were conducting counter terorist training in the High Range area. During night insertion exercises with 5 Aviation Regiment, two Black Hawk helicopters collided. As a result three army aircrew and fifteen SAS Regiment personnel were killed. This plaque marks the dedication of the Black Hawk Memorial on the 17th August 1997 as a community response to the tragic loss of 18 lives in an accident at High Range training area involving elements of the Special Air Services Regiment and 5th Aviation Regiment on 12th June, 1996. 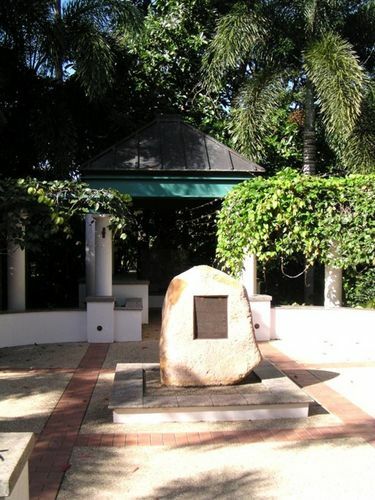 The memorial was funded by public subscription through the Black Hawk Memorial Fund Committee with the assistance of the Commonwealth Government, Queensland Government and Townsville City Council. It was unveiled by His Excellency the Hon. Sir William Deane AC, KBE, Governor General of the Commonwealth of Australia, with the support of the Mayor of Townsville, Cr. Tony Mooney and relatives of the soldiers who gave their lives in the peacetime service of their country.